Golden Belt: Become the king of the ring! Fight to hold the belt longer than your opponents and fill up your golden meter to win! Plague: A terrible plague has descended on the arena, dealing damage over time to infected players. Hit other players to pass the plague on and keep on the offensive to eliminate 3 opponents and win! Sudden Death: Who performs best under pressure? Everyone starts with 300% damage, half a meter of rage burst, and has 1 minute to score as many kills as possible. Coin Mania: It’s raining gold! Collect gold coins and watch your back – others can steal them from you. The player with the most coins at the end of the time limit wins! Bomber Blast: Are you ready for explosive action? 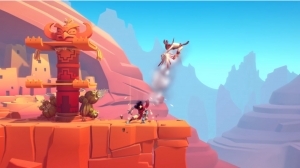 Players can’t stop dropping bombs – even after they run out of stocks – littering the arena with obstacles that offer a helping hand when it comes to launching others. The last player alive wins! 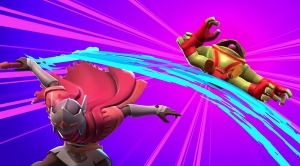 The mighty Beheaded from Dead Cells joins the fight in Brawlout! Check out what the bold undying hero brings to the table in this platform brawler! The action-packed platform brawler, Brawlout, is coming to PS4 this summer! 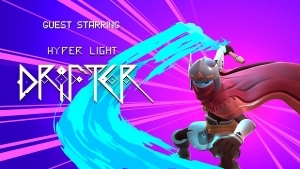 Get ready to brawl as the Hyper Light Drifter!